redPLAY is a WAP Portal Service (HTML Browser) which offers mobile content service & information (account details, video, games, etc.) to redONE users. How much do I need to pay to subscribe? Type ON < space >< keyword > and send to 23388. How many services can I subscribe to at the same time? You may subscribe to as many services as you wish. However, you are not allowed to subscribe to the same service more than once. What type of content is available in redPLAY? In redPLAY, you will be able to subscribe to a variety of videos and games. How does the 7 Days FREE subscription work? You will be able to instantly enjoy the subscription content for free only from day 1 to day 7 of subscription. When can I enjoy the FREE 7 Days promotion? 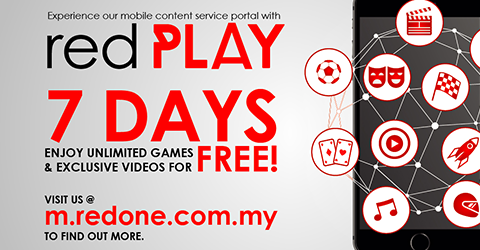 From day 1 of your subscription to redPLAY services to day 7.
Who can enjoy the FREE 7 Days promotion? All redONE customers who subscribe to redPLAY services can enjoy the promotion. How will I know that the FREE 7 Days promotion is over? You will receive a SMS notification via short code, 23388, with a reminder to auto renew your subscription. Can I re-subscribe to the content that I have unsubscribed from? Yes, you can. However, you can only enjoy the FREE 7 days promotion once. Will I still receive the content if my mobile phone is switched off? Yes, it will be sent to your mobile phone once you have switched it on. Where can I download redPLAY content? You can visit redPLAY WAP portal via your mobile phone at m.redone.com.my. Unless the context otherwise requires, the following terms shall have the corresponding meanings indicated below. This Service shall be applicable to redONE customers subject to these Terms and Conditions. 3.1 The Services include access to products and services of third parties either directly or via links to site(s) operated by third parties. 3.2 You acknowledge and agree that you are only permitted to use the Sites and the Services as expressly set out in these Terms and Conditions or on the Sites or third party terms and conditions applicable to the products and services, which may be posted from time to time in connection with such products and services. 3.3 You agree that the Sites and usage of the Services are for your own personal use only on any Mobile Device or software to make such connection to the Sites and ensure the compatibility of the hardware and software will not cause any interference or disturbance to the Service. (c) copy or use any material from the Sites and/or the Services for any commercial purpose, remove, obscure or change any copyright, trade mark or other intellectual property right notices contained in the original material, or from any material copied or printed off from the Sites, or obtained as a result of the Services. Any Participant who violate the terms and conditions herein, tamper with the operation of the Promotion, perpetrate fraud or abuse, or engage in any conduct that is deemed detrimental or unfair to the Organisers, the Promotion or any other Participant (in each case determined at the Organisers’ sole discretion) are subject to disqualification from entry or participation in the Promotion. The Organisers reserve the right to disqualify Participant(s) whose eligibility is in question or who is otherwise ineligible to participate in the Promotion or enter into the Promotion, and to have any declared Prize(s) for such Participant(s) be forfeited with. 3.5 You may opt out from the Service or from receiving the Content at any time upon your subscription to the Service/Content by sending “STOP ALL” or “STOP” to . i) indemnify and shall keep indemnified redONE from any loss, damage, liability or expense, arising from any claims for libel, invasion of privacy, infringement of copyright, patent, breach of confidence or privilege or breach of any law or regulation whatsoever arising from the Content transmitted, received or stored via the Service or part thereof and for all other claims arising out of any act or omission of your or any unauthorised use or exploitation of the Services or part thereof. (e) to transmit or post any content that contains any harmful, damaging or destructive programs. (i) hack into, make excessive traffic demands, deliver or forward chain letters, “junk mail” or “spam” of any kind, surveys, contests, pyramid schemes or otherwise engage in any other behaviour intended to inhibit other users from using and enjoying the Sites and/or the Services or any other web site, or which is otherwise likely to damage or destroy redONE’s reputation or the reputation of any third party. 5.1 redONE reserves the right to make any alteration or changes to the Service, or any part thereof, or suspend the Service or any part thereof without prior notice and redONE shall not be liable for any loss or inconvenience to you resulting therefrom. 5.2 redONE reserves the right at its absolute discretion, from time to time, to vary, add to or otherwise amend these Terms and Conditions or any part thereof. You will be given written notice of such amendments. Your continued use of the Service after the effective date of any variation, addition or amendments to these Terms and Conditions shall constitute your unconditional acceptance of such variations, additions or amendment. 5.3 Unless otherwise notified by you, you agree that redONE may send you notifications relating to promotional and marketing activities from time to time. You may opt out from receiving any promotional or marketing messages from redONE by sending OUT to the respective short code from which the promotional or marketing messages originate. 5.4 redONE may extract any details or Personal Information or any other data from you which is required to be used as evidence in court and/or when necessary in the event of a suspected and or proven misuse of the Service. 5.5 redONE may run campaigns/contest or promotions in relation to the Service or Content as may be notified to you from time to time. You agree that your participation in such campaign/contest/ promotion shall be subject to the specific terms conditions of such campaign/contest/promotion. 6.1 All trademarks used on the Sites and/or the Services are the trademark of redONE. 6.2 You acknowledge and agree that the Services and the Sites or any part thereof, whether presented to you by redONE, advertisers or any third party are protected by copyrights, trademarks, service marks, patents, or other proprietary rights and laws. All rights are expressly reserved. 6.3 You are only allowed to use the Sites and the Services as set out in the Terms and Conditions, and nothing on the Sites and/or the Services shall be construed as conferring any licence or other transfer. 7.1 redONE reserves the right to impose any charges, fees or subscriptions (“Charges”) for access to the Sites or for the use of the Services. Some Services may be chargeable as indicated on the Sites and in any accompanying Terms and Conditions. The Charges shall be reflected in your bill if you are a postpaid customer or shall be deducted from your account if you are a prepaid customer. 7.2 You will need to provide all equipment necessary to access the Sites and the Services on the Internet, and be liable for payment for your local telephone call and data charges at the rates published by the telephone operator with whom you make your local calls, or any other Internet access charges to which you may be subjected to. If your equipment does not support relevant technology including but not limited to encryption, you may not be able to use certain Services or access certain information of the Sites. 7.3.1 redONE may impose step down charging for specific Content as may be notified by redONE to you from time to time subject to the term and conditions to of such Content. For the avoidance of doubt, the validity period of such Content, the number of Contents may vary due to the step down charging. 7.4 If any supply made under these Terms and Conditions is a taxable supply to which the applicable tax (including but not limited to the Malaysian Services Tax would apply (Applicable Tax), then redONE reserves the right to levy the Applicable Tax at the prescribed rate and you agree to pay the amount of the Applicable Tax. 8.1 The Content for the Service is provided by third party. redONE does not filter or edit the Content and is under no obligation to censor the Content or information provided even if it is a co-branded or promoted by redONE. 8.2 It is your sole responsibility to ensure that the Sites and the Services are suitable for your purposes and are up-to-date. The Services and in particular, Charges are periodically updated and you should check the Sites and the Services regularly to ensure that you have the latest information. You should also refresh your browser each time you visit the Sites and the Services, to ensure that you download the most up to date version of the Sites and the Services. 8.3 The Sites and the Services are provided on an “as is” basis. Although every effort has been made to provide accurate information on these pages, neither redONE, nor any of its employees, members of the redONE Group, their suppliers, employees, make any warranty, expressed or implied, or assume any legal liability (to the extent permitted by law), or responsibility for the suitability, reliability, timeliness, accuracy or completeness of the Services or any part thereof contained on the Sites or in the Services. 8.4 You acknowledge that redONE is unable to exercise control over the security or subject matter of Content passing over the redONE Network, the Sites or via the Services, and redONE hereby excludes all liability of any kind for the transmission or reception of infringing Content of whatever nature. 9.1 The Sites may contain links to websites, web pages operated by third parties and you agree that your use of each website, webpage and service is also subject to the terms and conditions, if any, contained within each website or webpage or attached to any products or services of these third parties. These Terms and Conditions shall be deemed to be incorporated into each set of the terms and conditions. In the event that there is any conflict, the terms and conditions contained within the relevant website or webpage, or attached to the relevant products or services shall prevail over the Terms and Conditions. 9.2 redONE assumes no responsibility for and does not endorse unless expressly stated, created or published by third parties that is included in the Sites and the Services or which may be linked to and from the Sites. 9.3 The Sites and/or the Services may be used by you to link into other websites, resources and/or networks worldwide. redONE accepts no responsibility for the Content, services or otherwise in respect of these, and you agree to conform to the acceptable use policies of such websites, resources and/or networks. 9.4 You agree that redONE does not generally and is not required to monitor or edit the use to which you or others use the Sites and the Services, or the nature of the Content and redONE is excluded from all liability of any kind arising from the use of the Services, and in particular but without limitation to the foregoing, the nature of any Content. Notwithstanding the foregoing, redONE reserves the right to edit or remove any Services and/or Content, at any time as redONE deems necessary, in order to prevent any breach of the Terms and Conditions or any breach of applicable laws or regulations. 10.1 redONE reserves the right to modify the Sites and/or the Services, or suspend or terminate the Sites and/or the Services, or access to part or all of them at any time. 10.2 redONE reserves the right to revise the Terms and Conditions at any time. Such variations shall become effective after being posted on the website. By continuing to use this website you will be deemed to have accepted the varied Terms and Conditions.